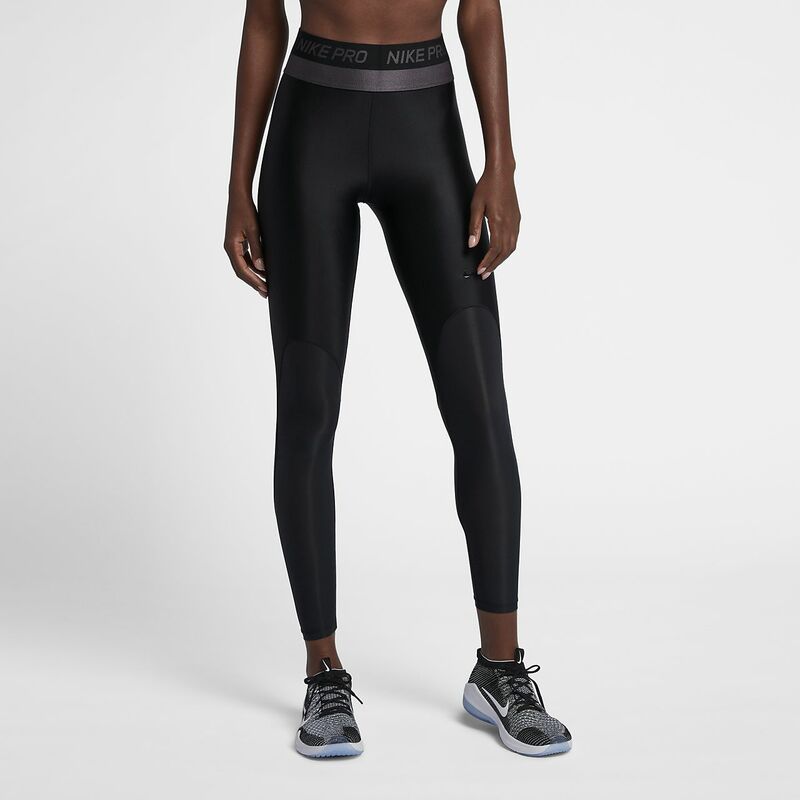 The Nike Pro HyperCool Women's Mid-Rise Training Tights feature ultra-lightweight fabric that's 80 grams lighter than any Nike Pro material, and sheer mesh panels in high-sweat zones to cool you off. Its double elastic waistband provides a smooth, secure, high-rise feel. Pair your look with any sports bra or crop top. COOLING COVERAGE FOR INTENSE PERFORMANCE. The Nike Pro HyperCool Women&apos;s Mid-Rise Training Tights feature ultra-lightweight fabric that&apos;s 80 grams lighter than any Nike Pro material, and sheer mesh panels in high-sweat zones to cool you off. Its double elastic waistband provides a smooth, secure, high-rise feel. Pair your look with any sports bra or crop top. Nike Pro HyperCool combines targeted breathability with sweat-wicking technology. Sheer mesh on the lower legs adds ventilation. The fabric weighs 80 grams lighter than traditional Nike Pro material, giving you a light, comfortable feel throughout every workout. A two-tier elastic waistband provides a smooth, secure feel when working out. • Fabric: Body: 79% nylon/21% elastane. Panels: 69% nylon/31% elastane. Gusset lining: 100% polyester. These tights are amazing. I fell off my bike and got dragged along tarmac. These tight not only saved my skin from being ripped off but came away with only 2 tiny holes where I landed. Brilliant for running in too.